WIN Learning serves schools, community colleges, adult education programs, corrections, workforce centers, and businesses to ensure that all learners and job seekers have the skills to be successful in their path to career readiness. WIN's Career Readiness Courseware and Credentials help learners achieve foundational academic and employability work habit skills. We take pride in helping our partners redefine their career ready community efforts with ongoing and timely product enhancements. See what's new and exciting! Learn about the user enhancements and added features in the WIN Career Readiness System January 2019 release update. WIN Learning's career readiness proctored assessments now support Chromebook LockDown Browser (LDB). We are excited to offer this solution to our clients who work with managed Chromebooks. Users must be using a “managed Chromebook” and have the lockdown browser kiosk properly installed. Users who are currently taking proctored assessments on Chromebooks with the lockdown browser turned off will no longer be able to do so. The IT representative managing the Chromebook must follow the instructions to installing the lockdown browser kiosk. For instructions or assistance with installing the LDB, contact support@winlearning.com. The SpeechStream read-aloud tool powered by TextHelp is now available in the Ready to Work Assessments, Essential Soft Skills Assessment, and NWRC Assessment for individuals with a read-aloud accommodation.The tool allows the user to select individual words, phrases, sentences, or all text to be read aloud. It also highlights words as it reads them aloud. In Settings, the user can adjust the voice speed, highlighting color, and whether the read-aloud is activated by click or hover. The tool can be collapsed or moved to ensure it doesn’t cover any important information on screen. For more details, see our Release Notes & Updates for a How to Use SpeechStream tutorial. If you have interest in this tool for your organization, email WIN Learning at info@winlearning.com. 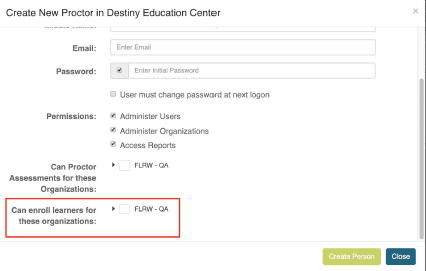 When provisioning new proctors, administrators can now permit proctors the ability to enroll learners into multiple organizations. For example, in a workforce setting, there might be learners from Adult Education and Vocational Rehabilitation in the same assessment environment. This feature streamlines the enrollment and proctoring experience for proctors who are responsible for learners from multiple organizations or sites and ultimately improves the integrity of reporting. The ability to display one certificate or credential design or another based on date earned is now available. For example, in the case of Florida Ready to Work, learners who earned a Ready to Work credential prior to Jan. 8, 2019 will get a credential with Governor Scott’s signature, while learners who earned a credential after Jan. 8, 2019 will get a credential with Governor DeSantis’ signature. To request this feature, contact your Professional Services representative or support@winlearning.com. WIN is committed to providing valid and reliable assessments and to updating content regularly. We are incorporating new field test items into the Ready to Work and Essential Soft Skills assessments. The items that perform well based on the psychometric data collected will be fully incorporated into the assessments. We follow standard field testing practices that maintain the validity of the assessments. A number of enhancements have been applied to Reports 2.0. A “Grand Total” row has been added to the Learner Listing and Individual Reports. On the Learner Listing report, users can now multi-select organizations for the report. We also improved overall reports performance.